The temporomandibular joint (TMJ) is a synovial articulation between the temporal bone and mandible. Movements of the TMJ are regulated by an intricate neurological controlling mechanism, which is essential for the system to function normally and efficiently. Lack of such harmony may cause disruptive muscle behavior or structural damage to any of the components. Temporomandibular disorder (TMD) is a term used to describe a number of related disorders involving the TMJ, masticatory muscles, and occlusion and having some symptoms in common, such as TMJ or muscle pain, restricted movement, deviation or deflection of the mouth opening path, muscle tenderness, and intermittent joint sounds., Due to high prevalence and variability of complaints, TMD is diagnosed by associating signs and symptoms, as some characteristics may be frequent even in a nonpatient population. For appropriate diagnosis, it is appropriate to use both patient history and clinical examination, supplemented with adjunctive diagnostic procedures as needed, to develop a differential diagnosis. In 1992, Dworkin and Le Resche developed Research Diagnostic Criteria for Temporomandibular Disorders (RDC/TMD) to provide a system for clinical research to allow standardization and replication of research into the most common forms of muscle and joint-related TMD diagnosis. The RDC/TMD transfigured the conventional criteria and lead to an accurate diagnosis of this disorder. The RDC/TMD demonstrates adequately high reliability for the TMDs' diagnosis, supporting its use in clinical investigations and decision-making for treatment modalities. Several nonsurgical and surgical methods have been advocated for patients with TMJ dysfunction. A treatment strategy for TMDs consists of various nonsurgical and surgical methods. A nonsurgical approach is recommended for the initial management of TMDs,,, as surgery in this region is associated with many risks. Many studies indicated that nonsurgical treatment can eliminate the signs and symptoms in patients with TMDs. Splint therapy may be defined as the art and science of establishing neuromuscular harmony in the masticatory system and creating a mechanical disadvantage for parafunctional forces with removable appliances. A properly constructed splint supports a harmonious relationship among the muscles of mastication, disk assemblies, joints, ligaments, bones, teeth, and tendons. Properly fabricated splints have at least six functions, including the following: (1) to relax the muscles, (2) to allow the condyle to seat in centric relation (CR), (3) to provide diagnostic information, (4) to protect teeth and associated structures from bruxism, (5) to mitigate periodontal ligament proprioception, and (6) to reduce cellular hypoxia levels. This study is an attempt to evaluate the response of soft occlusal splint therapy in the management of patients presenting with TMDs in each diagnostic category based on RDC/TMD criteria. 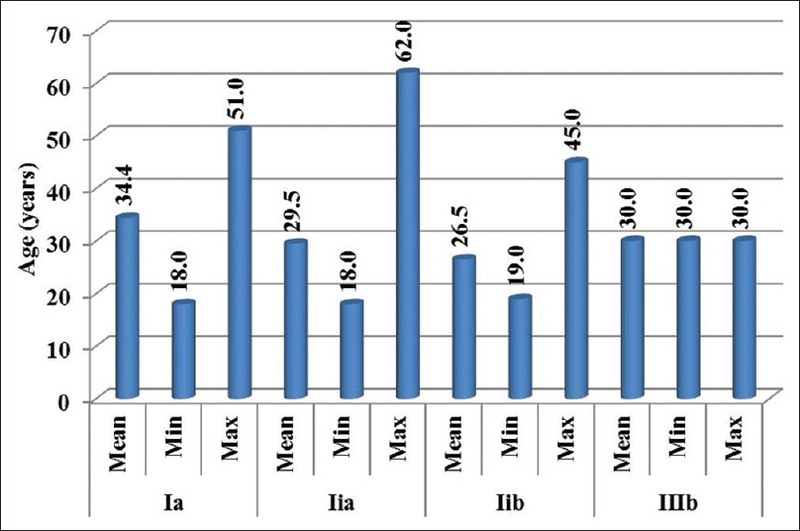 This study was conducted on 50 patients (20 males and 30 females) with TMDs, who reported to the outpatient Department of Oral Medicine and Radiology, Modern Dental College and Research Centre (MDCRC), Indore, within a period of 15 months. As it was an uncontrolled trial, there is no control group. Comparison of pre- and post-treatment parameters was carried out in the same sample. Ethical approval was obtained from the Institutional Ethics Committee and got clearance from the Scientific Research Committee of Devi Ahilya Vishwavidyalaya, Indore. All ethical guidelines were followed. Patients diagnosed with TMD, with no history of systemic, musculoskeletal, or neurological disorders were included in the study. None of the subjects had any history of orthodontic treatment, and no subject had any history of malignant disease or major or minor surgery in the orofacial region in the past 3 months. The basic criteria for patient selection and participation in the study were the documented presence of masticatory muscle or TMJ pain, limited range or disturbed mandibular movement, TMJ sound, and pain on jaw movement. Each patient was given proper instructions about the aim of the study and a brief explanation was given about the TMDs and treatment procedures. A signed informed consent form was taken from each patient participating in the study. For each patient, a standardized protocol was followed that contained collection of personal and demographic data followed by detailed recording of clinical case history at the time of diagnosis regarding onset, duration, and progress of symptoms. Pain characteristics such as type, nature, and severity were noted. Pain response to jaw activities such as during mastication was also recorded. The pain was evaluated from responses to the visual analog scale (VAS), 100-mm-long continuum. The extremes were labeled as no pain and worst possible pain. Its simplicity, reliability, and validity, as well as its ratio scale properties, make the VAS the optimal tool for describing pain severity or intensity. This is followed by a complete examination of muscles, TMJ, and dental structures for evaluating the signs and symptoms of TMD. After that, complete examination of muscles, TMJ, and dental structures was performed for evaluating the signs and symptoms of TMD. All the muscles of mastication were palpated for tenderness, and positive findings were noted down. In TMJ examination, facial symmetry/asymmetry, the extent of mouth opening, interincisal distance (IID), and possible jaw deviation or deflection during mouth opening were noted. The TMJ was palpated with gentle digital pressure bilaterally to assess the degree of pain and quality of joint noises (clicking/crepitus), and their relationship with jaw opening. Auscultation with stethoscope was done for confirmation of palpatory findings. A complete dental examination was performed which includes a recording of maxilla–mandibular occlusal relationship, occlusion interferences (presence of any high points or premature contacts), presence of any restoration or prosthesis, and missing teeth. Special emphasis was given to the attrition and occlusal wear facet which would suggest the presence of parafunctional habits such as bruxism or clenching. When data recording for each patient had been completed, exploration was carried out according to RDC/TMD axis I criteria, in accordance with routine clinical practice. All the patients were classified into diagnostic categories according to RDC/TMD criteria. All patients underwent standardized radiographic examinations to assess the joint status. For radiographic examination, orthopantomograph machine (Planmeca 2002 CC Proline Pan/Ceph X-Ray) with 60–80 kVp ± 2.5 kVp, 4–12 mA ± 1.0 mA, and 2.5–18 s ± 10% exposure time with constant magnification of 1.2 was used. A standardized panoramic view and a panoramic TMJ projection (open and close) were obtained to check for joint status, to estimate the condylar position at maximal mouth opening in relation to the crest of the articular eminence, to identify osteoarthritic changes in the lateral condyle and for dental assessment. All radiographs were obtained at 70 kVp, 8 mA, and an exposure time of 6.3 s.
All the examinations were performed by three investigators. Training and calibration of the investigator were carried out under the guidance of an expert examiner. Clinical training and calibration were done first by practicing on a group of 10 subjects and then on 20 subjects twice with the time interval of half an hour with a wide range of level of disease conditions. This was done to ensure uniform interpretation, understanding, and application of the codes and criteria for various conditions to be observed and recorded. The Kappa value (0.8) for calibration exercise showed good agreement for observations and measurement. Upon completion of the evaluation and classification of each patient in each diagnostic category of TMD, TMJ joint stabilization splint has been planned for each patient [Figure 1]. The treatment began with counseling the patient. Each patient received a thorough explanation of their disorder and reassured (when indicated) that it is not as serious as might have been thought. Each patient is then provided with a TMJ joint stabilization splint [Figure 2]. The patients were instructed to wear their splints while sleeping. The splint was adjusted over several visits as the masticatory muscles relax until a more comfortable and less painful, consistent jaw relationship is reached. Then, the patients should be reviewed at regular intervals. The splint therapy was continued until the maximal interincisal distance (MID; active opening without any assistance) increased to 40 mm or greater and the pain was reduced. After a period of successful splint therapy (normally between 2 and 3 months), patients can be weaned off the splint. As a part of instructions, all the patients were asked to chew soft foodstuff, equally from both the sides of the jaw; not to open the mouth too wide; support the mandible while yawning; do hot and cold fomentations over the affected region, alternatively for at least two to three times a day; do gentle self-massage to the painful areas regularly throughout the day; and some of them were instructed to perform a range of motion exercises four times per day (three times after each meal and once before bedtime). The effectiveness of the splint therapy was evaluated at every month for the next 6 months after the institution of treatment. The results of treatment were evaluated with respect to pain in the TMJ and masticatory muscles, MID, and TMJ sounds. When the entire data had been collected, statistical analysis was performed to analyze the available data, estimated from the individuals in various groups. The values were tabulated and evaluated statistically using t-test and Kruskal–Wallis test with help of Statistical Package for the Social Sciences (SPSS) software (Version 14.0. Chicago, SPSS Inc.). P values less than 0.01 were considered as highly significant, between 0.05 and 0.01 as significant, and more than 0.05 as nonsignificant. In the studied group of 50 responding patients, 30 were females (60%) and 20 were males (40%) with females being more frequently affected with TMD in each age range than males [Figure 3]. Among all the diagnostic categories, group II (disk displacements) had the largest number of patients; 24 of 50 (females = 13; males = 11; mean age = 29.5 years) patients had disc displacement with reduction, that is, diagnostic subset IIa, and 14 of 50 (females = 6; males = 8; mean age = 26.5 years) patients had disc displacement without reduction with limited opening, that is, diagnostic subset IIb. The second largest group was group I, which included 11 of 50 (females = 10; males = 1; mean age = 34.4 years) patients; these were patients with diagnoses of myofascial pain, that is, diagnostic subset Ia. 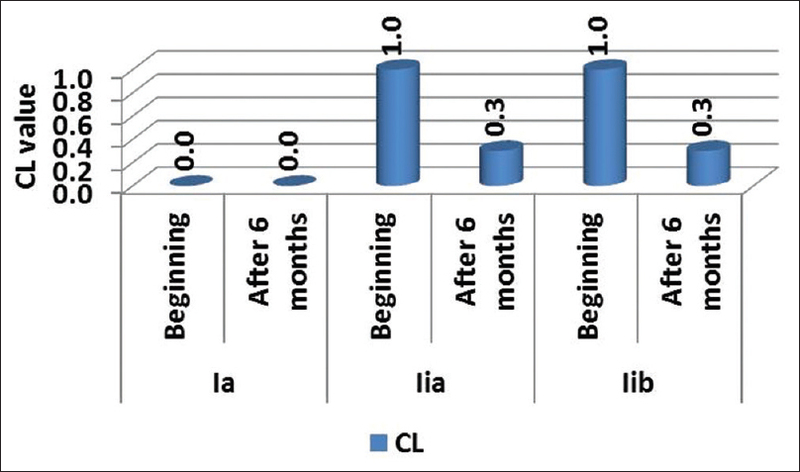 Group III (arthralgia, osteoarthrosis, or osteoarthritis) was the smallest group with only 1 female patient out of 50 with mean age of 30 years, which was categorized into IIIb category, that is, osteoarthritis of TMJ [Figure 4]. The average pain sensation score (VAS score), average IID, and joint sound were noted before the institution of treatment. After 6 months of the follow-up period, the posttreatment scores of the 50 assessed patients in all the diagnostic categories showed a statistically significant improvement. There was a progressive reduction in the mean pain score noted with maximum improvement seen in type Ia category (myofascial pain). Furthermore, it is important to observe that reduction in pain sensation was also noted in type IIIb category (osteoarthritis of TMJ) with soft occlusal splint therapy [Figure 5]. Improvement in the average IID was noted in all the subsets of patients. Using F-test for the IID value, when comparisons were drawn between these groups after treatment, the difference was found to be statistically significant (P = 0.05–0.01). And using paired t-test for the IID value, when each group was compared before and after treatment, the difference was found to be highly statistically significant (P < 0.01) [Figure 6]. In all the groups, improvement in the average joint sound (clicking) was noted after treatment with occlusal splint therapy; however, the improvement noted was not statistically significant (P > 0.05) [Figure 7]. Various treatment modalities for TMD are available and have been tried and tested over time. Selecting a specific therapy for patients with TMD depends on clinician's expertise, patient's signs and symptoms, and elimination of possible etiologic factors. This study was undertaken to evaluate the efficacy of occlusal splint therapy in the treatment of a patient with TMD. 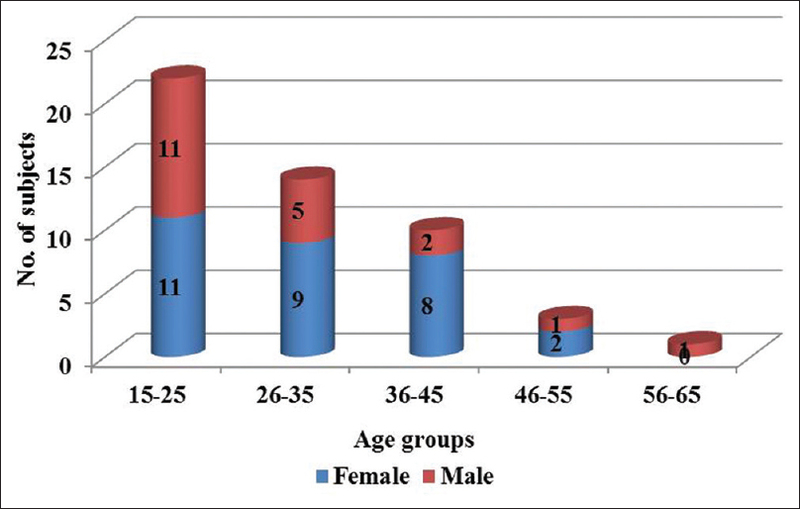 In this study, patients in the age range of 15–25 years (44%) constitute the largest group of patients. This may be due to increased stress, especially in university students and in younger individuals as a consequence of malocclusion and other environmental factors which work alone or in combination with each other. Epidemiological studies have documented a greater frequency and severity of TMDs in females than in males. In a recent study conducted on Swedish adolescents by Nilsson M et al., the prevalence of TMD pain was found significantly more common among females than males. This is in accordance with our study where females were found to have a higher risk of TMD than males with a risk ratio of 3:2 (30 females, 60% 20 males, 40%). Manfredini et al. also made similar observations in a study of 433 patients in whom the risk ratio was 2.6:1 (276 females, 73.2% 101 males, 26.8%). The difference in pain perception is attributed to distinct anatomic and hormonal features in women and men. Males have fat-free mass and larger muscle thickness, and also maximal voluntary contraction is significantly greater in males, contributing to less pain perception in males. Muscle metabolism also differs between the sexes responsible for the difference in pain perception among the genders. It is evident from the literature that endogenous reproductive hormones (especially estrogen) may play a pathophysiological role in TMD-related pain., Studies in humans have shown that the appearance of pain in the context of TMDs increases approximately 30% in patients receiving hormone replacement therapy in postmenopausal women and approximately 20% among women who use oral contraceptives. In females, the peak incidence occurred particularly in the middle age (at the third and fourth decades) and they may have more severe constitutional distress, which include headaches, joint and muscle tenderness, and joint clicking. However, in our study, females in the age group of 15–25 years are more commonly affected which are in contrast to the previous studies. These differences have been explained by behavioral changes, psychosocial factors, hormonal changes (puberty), and constitutional factors; however, no conclusions have been drawn. 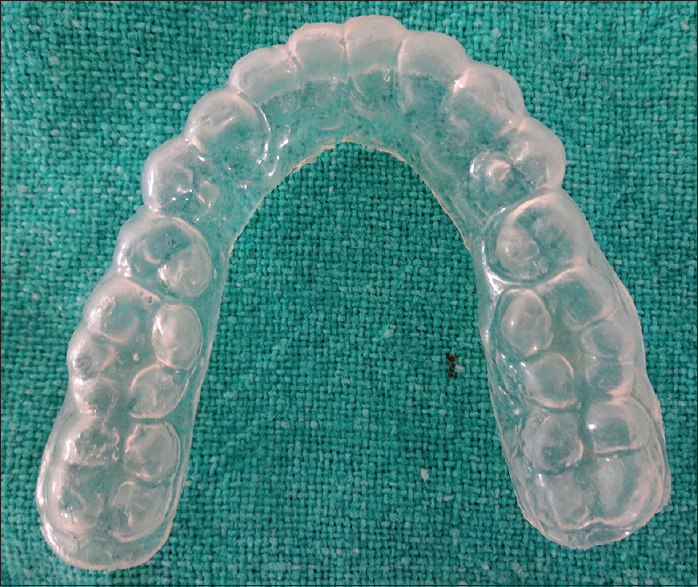 Occlusal splint therapy has been advocated for managing the TMD in this study as it offers various advantages, such as it is relatively simple technique, reversible, noninvasive, has better patient compliance, and is more cost-effective than other treatments. A high degree of patient acceptance has been reported with soft splints. It has been well-documented that parafunctional activity may cause hyperactivity of the masticatory muscles, and a muscle that is fatigued through ongoing muscle hyperactivity can present with pain. If hyperactivity is stopped, the pains caused by this activity usually will disappear. A soft, resilient material may help in distributing the heavy load that occurs during parafunctional activity, and therefore help in reducing the pain. When a splint is inserted, there is an adaptation to a new resting postural position. Occlusal splints that increase the occlusal vertical dimension beyond the freeway space cause an immediate adaptation to a new freeway space at an increased vertical dimension leading to a decrease in muscular effort resulting in relaxing of the masticatory muscles, and hence the TMJ. Thus, an occlusal splint allows a muscle to function more efficiently during contact and be less active during postural functions. In a study conducted by Naikmasur et al., 55% of patients showed a complete reduction in muscle tenderness and the remaining 45% had a significant reduction. About 70% of the patients showed VAS scores of less than 5 on a 100-mm continuum scale. 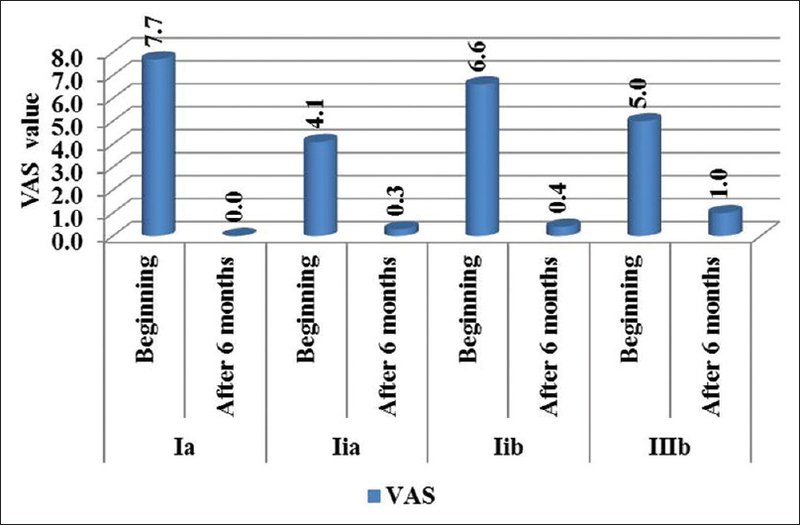 Four patients had clicking at the time of diagnosis, which had completely decreased by the third month of treatment follow-up. Similarly, in our study, progressive reduction in the mean pain score and reduction in the average joint sound (clicking) were noted after treatment with occlusal soft splint. A possible explanation for this improvement is the fact that occlusal splints results will relax the elevator and positioning muscles and contribute to the reduction in abnormal muscle hyperactivity. In our study, reduction in pain sensation was noted in all the groups after treatment with occlusal splint therapy; however, the improvement noted was not statistically significant (P > 0.05). The reduction in pain may be due to the reduction in the spasm of the muscles or due to the forward positioning of the disc, allowing the retrodiscal tissue space to repair. Furthermore, a statistically significant (P < 0.05–0.01) improvement was observed in IID with conservative treatment. This may be explained on the basis of reduction in pain and spasm of the muscles or due to forward positioning of the disc, facilitating anterior glide of the mandibular condyles during the opening of the mouth. Some of this improvement may be due to naturally occurring healing process or it may be hypothesized that the posterior attachment should gradually elongate during the period of subjective symptom improvement. In this study, the effectivity of the treatment on the joint sounds produced by movements of the mandible was clearly shown. In all the groups, improvement in joint sound (clicking or crepitus) was noted after institution of occlusal splint therapy; however, the improvement noted was not statistically significant (P > 0.05). The joint sound ceased completely in some of the cases, whereas in a majority of cases the character of the sounds changed and the intensity of the sound was reduced and their frequency diminished, to the effect that they disappeared nearly completely at the time of mouth opening. This may be explained on the basis of forward positioning of the disc, facilitating anterior glide of the mandibular condyles during the opening of the mouth, resulting in a reduction of joint sound. In summary, it appears reasonable to conclude that occlusal splint therapy, when implicated in the early stages of dysfunction, is the best prevention of a chronic course due to structural pathology. We hope that the result of the present clinical study may serve as a guide for further future studies with a larger representative sample, with longer duration of follow-up to confirm our findings and to justify an evidence-based management protocol. Bonjardim LR, Lopes-Filho RJ, Amado G, Albuquerque Jr RLC, Goncalves SRJ. Association between symptoms of temporomandibular disorders and gender, morphological occlusion, and psychological factors in a group of university students. Indian J Dent Res 2009;20:190-4. Dimitroulis G. Temporomandibular disorders: A clinical update. BMJ 1998:317:190-4. Nomura K, Vitti M, Oliveira AS, Chaves TC, Semprini M, Siéssere S, et al. Use of the Fonseca's questionnaire to assess the prevalence and severity of temporomandibular disorders in Brazilian dental undergraduates. Braz Dent J 2007;18:163-7. Epstein JB, Caldwell J, Black G. The utility of panoramic imaging of the temporomandibular joint in patients with temporomandibular disorders. Oral Surg Oral Med Oral Pathol Oral Radiol Endod 2001;92:236-9. Greenberg, Glick, Ship. Burket's Oral Medicine. 11th ed. Hamilton, Ontario: Elsevier Publication; 2008. Jerjes W, Upile T, Abbas S, Kafas P, Vourvachis M, Rob J, et al. Muscle disorders and dentition-related aspects in temporomandibular disorders: Controversies in the most commonly used treatment modalities. Int Arch Med 2008;1:23. Lyons MF. Current practice in the management of temporomandibular disorders. Dent Update 2008;35:314-6,318. Wright EF, North SL. Management and treatment of temporomandibular disorders: A clinical perspective. J Man Manip Ther 2009;17:247-54. Dylina TJ. A common-sense approach to splint therapy. J Prosthet Dent 2001;86:539-45. Poveda-Roda R, Bagan JV, Diaz Fernandez JM, Hernandez Bazan S, Jimenez Soriano Y. Review of temporomandibular joint pathology. Part I: Classification, epidemiology and risk factors. Med Oral Patol Oral Cir Bucal 2007;12:E292-8. Nilsson M, List T, Drangsholt M. Prevalence of temporomandibular pain and subsequent dental treatment in Swedish adolescents. J Orofac Pain 2005;19:144-50. Manfredini D, Chiappe G, Bosco M. Research diagnostic criteria for temporomandibular disorders (RDC/TMD) axis I diagnoses in an Italian patient population. J Oral Rehabil 2006;33:551-8. Soni A. A clinical manual on temporomandibular joint pain. In Soni A, editor. Etiopathogenesis of Temporomandibular Joint Pain. 1st ed. New Delhi: Akinik Publication; 2018. p. 34-5. Patil SR, Yadav N, Mousa MA, Alzwiri A, Kassab M, Sahu R, et al. Role of female reproductive hormones estrogen and progesterone in temporomandibular disorder in female patients. J Oral Res Rev 2015;7:41-3. Naikmasur V, Bhargava P, Guttai K, Burde K. Soft occlusal splint therapy in the management of MPDS – A follow up study. Indian J Dent Res 2008;19:196-203. Kai S, Kai H, Tabata O, Shiratsuchi Y, Ohishi M. Long-term outcomes of nonsurgical treatment in nonreducing anteriorly displaced disk of the temporomandibular joint. Oral Surg Oral Med Oral Pathol Oral Radiol Endod 1998;85:258-67.